Alternatively put together a special session and submit it by April 1, 2016. 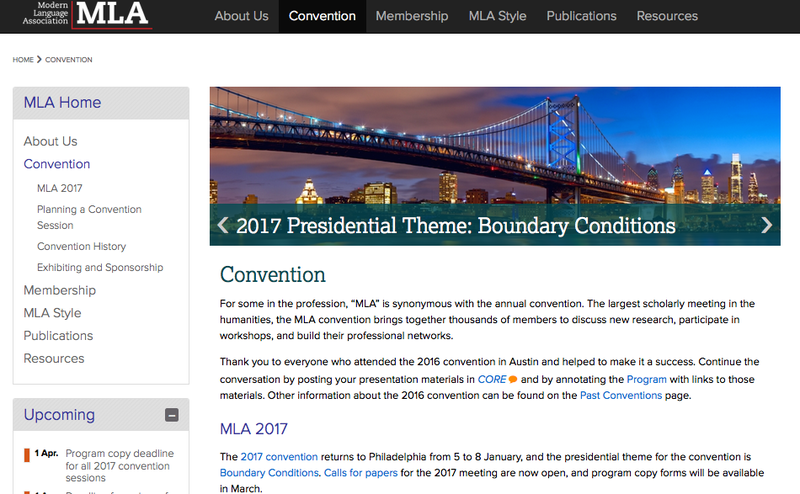 The Presidential theme is Boundary Conditions. Let’s make sure Palestine is a presence in the 2017 MLA program! Interrogating concepts of cosmopolitanism, exile, globality through the figure of the Arab refugee across historical/epistemic/disciplinary/geographical boundaries. 250-word abstracts and bios by 15 March 2016; Pauline Homsi Vinson (phvinson@gmail.com). Papers engaging the political resonances of Palestine for Chican@s. Intersections in various texts, teaching, or other topics. 200-300-word abstract; 1-page cv by 15 March 2016; José Navarro (jnavar17@calpoly.edu). Effects of the Balfour Declaration, debates, reactions, responses, and perspectives in literature and culture. 250 word abstracts to Tahia Abdel Nasser. 250 word abstracts by 15 March 2016; Waïl S. Hassan (whassan@illinois.edu) and Tahia Abdel Nasser (tgnasser@aucegypt.edu). Panel on past and current practices of dispossession in West Asia: statelessness, apartheid, genocide, migration, the forms and rhetorics of resistance. 300-word abstract by 7 March 2016; Nergis Ertürk (nerturk@psu.edu) and Amy Motlagh (amotlagh@aucegypt.edu). How are colonial spaces imagined, by colonized and colonizer? How does mapping, literal or metaphorical, infuse power relations into geographic imaginaries? 250-word abstract by 15 March 2016; Siobhan Craig (craig026@umn.edu). Historical approaches to “writing resistance” or “writing rebellion”: narrative construction of historical incidents of resistance, writing history as resistance, resistance to historico-literary approaches in our discipline. 300 word abstracts by 10 March 2016; Marguerite Helen Helmers (helmers@uwosh.edu). How do imaginative texts explore questions of justice that transcend national borders? Papers on all genres, periods, and regions welcome. 300-word abstract and brief cv by 12 March 2016; Melissa J. Ganz (melissa.ganz@marquette.edu).